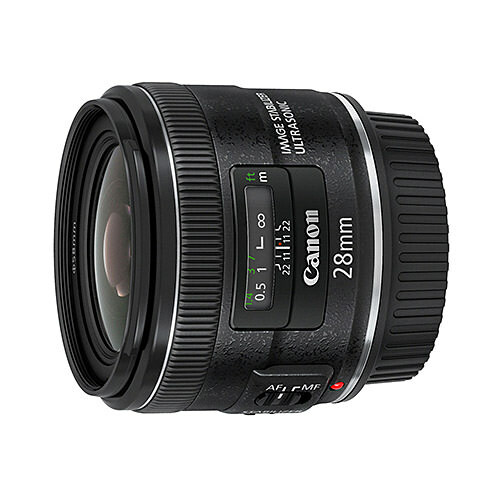 Lens Description: A 21st century update to a popular and widely used fixed focal length lens, the Canon EF 28mm f/2.8 IS USM is a fixed focal length wide-angle 28mm lens equipped with Canon Optical Image Stabilizer technology, superb image quality and performance perfect for use in any number of photographic applications. Sharp, clear images are easy with an Optical Image Stabilizer that offers up to 4 stops of shake correction while a ring-type USM and advanced CPU with optimized AF algorithms enable faster auto focusing. Aspherical lens elements help improve image quality on the periphery and lens coatings help minimize ghosting and flare. 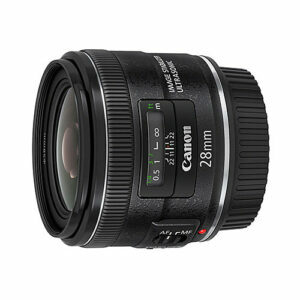 A 7-blade circular aperture diaphragm delivers beautiful, soft backgrounds. Compact and lightweight with outstanding lens performance, it\'s the perfect lens to go with any EOS DSLR camera whether shooting stills or video.